Ironically the building uses a lot of wood so it can fit into the wooden context, but thereby destroying woods in Borneo, in what appears to be an unssustainable way. 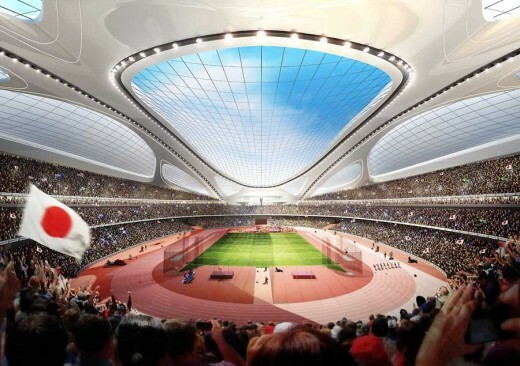 Citing a significant breach of the commitment to a sustainable 2020 Olympics, Japanese and international environmental groups recently called for an urgent independent investigation of the use of tropical formwork plywood that appears to originate from the notorious Malaysian logging company, Shin Yang, in the construction of the new National Olympic Stadium in Tokyo. The International Olympic Committee (IOC) and the Tokyo Olympic organizers have been repeatedly informed about the high risk of using illegal and unsustainable timber for Olympic construction. 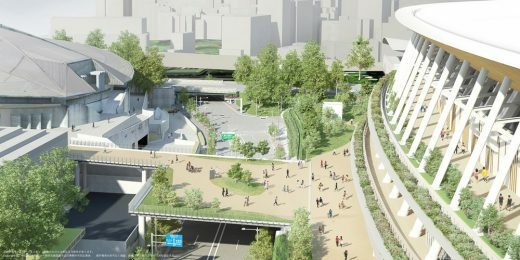 In December 2016, just days before construction started on the new Olympic Stadium, over 40 environment groups delivered a letter to the IOC warning that efforts by the Tokyo Olympic organizers and the Japanese government were inadequate to ensure the timber used for the Olympic construction would be legal and sustainable. NGOs maintained that failure to promptly mitigate the risks by requiring robust due diligence measures on the timber used for the Olympics could result in harm to biodiversity, the climate and local communities. 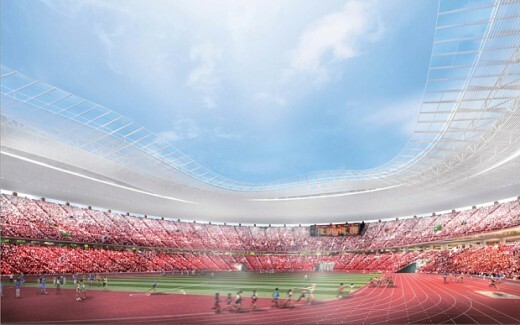 On April 3rd, investigators found tropical plywood being used to mould concrete for the Stadium construction with markings that appear to belong to Shin Yang. The markings resemble other Shin Yang produced plywood sold in Japan. Use of tropical plywood at the Stadium site was again confirmed on April 18th. Shin Yang is notorious as one of the ‘Big Six’ logging companies of Sarawak, Malaysia, where illegal logging is widespread and the destruction of forests is one of the most extreme cases in the world. Shin Yang has been systematically logging and clearing pristine rainforest, including a large area in the transboundary conservation area known as the Heart of Borneo. In 2016, it was found to be clear cutting over 40 football pitches of intact rainforests a day. Local communities and former employees of the company have independently alleged that Shin Yang hires armed gangsters to intimidate and assault those who voice concerns or act against the company’s interests. Shin Yang is implicated in human rights abuses affecting Indigenous People who claim customary rights to forest. . The “E-panel” marking on the plywood found at the construction site does not guarantee environmental sustainability or freedom from human rights abuses. “Shin Yang is one of the most notorious exploiters of Sarawak’s tropical forests, and plywood from this company would fail to meet any sustainability criteria. 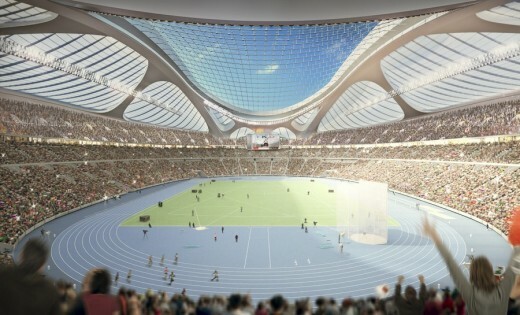 Use of Shin Yang plywood would be a clear breach of Japan’s commitment to host a sustainable Olympics. ” said Peg Putt of Markets for Change. “To use Shing Yang timber products is to deprive the vulnerable Indigenous Penan and Iban peoples of their customary rights, livelihoods, and cultural practices,” said Nicholas Mujah of Sarawak Dayak Iban Association. 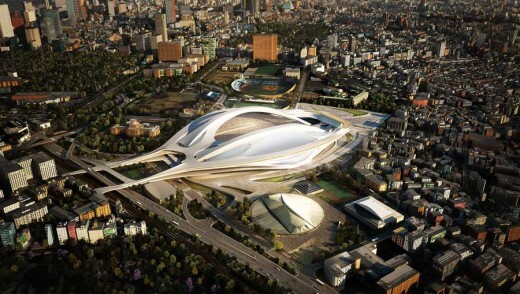 An additional concern is that the Tokyo Olympics Organising Committee has allowed a loophole in its wood products procurement policy that exempts formwork plywood used to mould concrete from environmental sustainability and human rights standards. The only policy that is applied is the extremely weak legality provisions of the Green Purchasing Law which has been repeatedly criticized for allowing wood at high risk of illegality to be imported into Japan as “legal wood”. 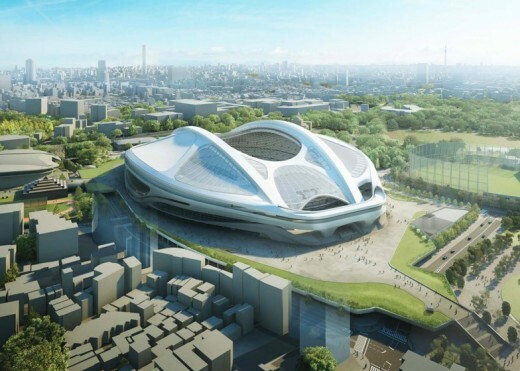 The environment groups are seeking an explanation from Japanese Olympics authorities and an open investigation to be conducted by a credible third party environmental auditor. The groups urged that until the issue is resolved, no more tropical plywood should be utilised on site. Ed – having worked in architects offices for 30 years I have found certification for hardwood tends to be fairly easy to check (typically the FSC certification is stated in the specification clauses and the contractor will provide documentation accordingly). However plywood is a difficult area with a real lack of accountability. Architects and Project Managers need to be more aware of this and exercise firm control, but they also need strong back-up from relevant authorities across the globe. It shouldn’t be the case that we rely on sustainability organisations and campaign groups to tidy up after our industry! Adrian Welch, architect & Editor. Timber from a Malaysian logging giant accused of deforestation and human rights violations is being used to construct the wooden stadium that will be the centerpiece of Tokyo’s Olympic Games, said a group of charities. An investigation by the charities this month twice found plywood from Sarawak-based Shin Yang at the National Stadium construction site – a breach of Japan’s pledge to host a sustainable Olympics in 2020, according to seven environmental and rights organizations. Shin Yang, one of the “big six” logging companies on the Malaysian part of Borneo, has systematically cleared pristine rainforest from the Southeast Asian island, said a statement by charities, including Global Witness and Rainforest Action Network, released on Thursday. 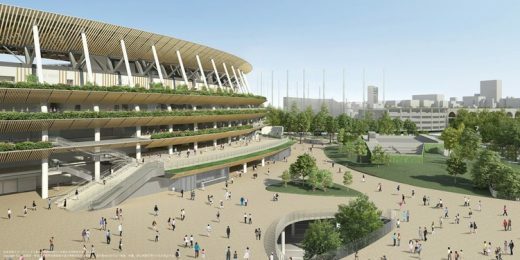 Tokyo’s Olympic stadium will be constructed around an unusual set of wooden lattices – a design conceived by architect Kengo Kuma to harmonize with a forest of oak and camphor trees surrounding the nearby Meiji shrine in the Japanese capital. According to a 2015 report by Global Witness, Shin Yang has cut down over 40 hectares of forest a day on Borneo, where half the plywood used in Japan’s building and furniture industries is produced. Shin Yang is involved in a decade-long conflict in the central part of Malaysian Borneo, with the Penan indigenous minority. Community leaders told investigators for a 2014 report by the Human Rights Commission of Malaysia that forest clearance to create palm oil plantations violated their rights to traditional lands on which they depend for their livelihoods. “Shin Yang is one of the most notorious exploiters of Sarawak’s tropical forests, and plywood from this company would fail to meet any sustainability criteria,” said Peg Putt, head of Markets for Change, one of charities. 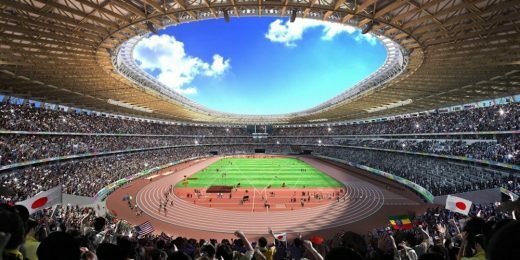 The International Olympic Committee had agreed on a Sustainable Sourcing Code for Timber with Tokyo Metropolitan Government and National Government to assure venues for the games met ethical standards. Japan Sport Council (JSC), the government body in charge of building Olympic competition venues, said Shin Yang timber was being used. 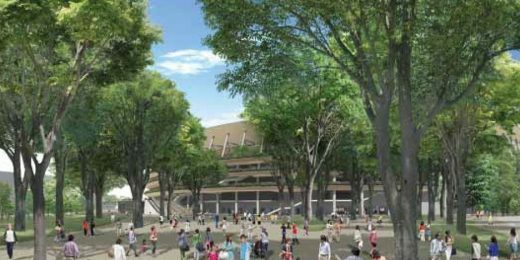 But both JSC and Taisei, the building company leading the stadium’s construction, told Thomson Reuters Foundation all timber on site meets requirements laid out in the code. Hana Heineken of Rainforest Action Network said a provision in the code exempted cheap plywood used to shape concrete from the sustainable sourcing regulations. According to the report from the Human Rights Commission of Malaysia, Shin Yang deforestation threatened local communities’ ability to continue traditional ways of life in the forest, and recommended the government step in to protect the Penans, one of the country’s most marginalized groups.